The war between England and France has taken to space. At the end of the War of the Sixth Coalition, Napoleon is defeated and sent into exile on the far side of the moon, but now he’s escaped and taken refuge on Venus. Arabella is undeterred. If the Company won’t help, she’ll do it herself. With her chaperone, Lady Corey, for no unattached gently bred female can travel alone, Arabella hires a privateer, Touchstone, and her captain, Daniel Fox, a good sailor with a penchant for gambling. Soon, she, Lady Corey, and the crew of Touchstone are underway. Partway there, they cross the trajectory of a French ship and a battle ensues. The Diana is captured. Arabella wants to free her beloved, not join him in captivity, but they are now prisoners of war, taken to the same outpost where Singh and his crew are detained. The rest, as they say, is history . . . but a history of award-winning author Levine’s devising. Juxtaposing space travel with historical episodes from the Napoleonic Wars, and contrasting polite English society with swashbuckling seafaring exploits, Mr. Levine has written a delightful, sometimes amusing, always exciting steampunk adventure. Many of the current prejudices of the day, such as Lady Corey’s well-meaning but disapproving attitude toward anyone other than Englishmen are contrasted with Arabella’s love for Captain Singh, as are the manners and morality of the times, in which a young woman, even one traveling on a privateer, must do so with a chaperone. Weaving into the story actual historical figures—Napoleon and Admiral, among others—provides the proper amount of reality into the reader’s suspension of disbelief, while the French enslaving of the Venusians and the Battle of Brussels fought with airships add that touch of the fantastic, as does a remarkable Venusian pet with a surprising reaction to having its tummy tickled. The battle of the two armored airships provides a rousing climax that should satisfy anyone’s love of a good tale of nautical sea battles transferred into outer space. 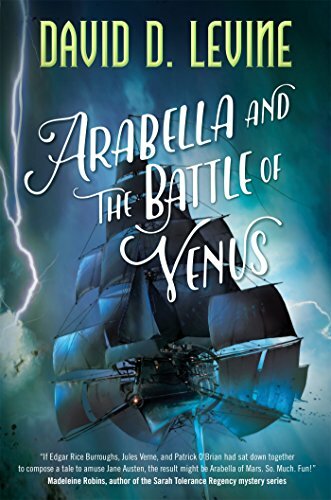 For those who like their history heavily dipped in fantasy or their science fiction a bit historical, Arabella and the Battle of Venus should fit either requirement.